For our writing and reporting seminar, we grad students were assigned a #NYFW story. We could cover any aspect of Fashion Week, as long as we spoke to people involved in it. I hung around outside Lincoln Center one afternoon and noticed the throngs of photographers–many more than there were fashion divas. I grew interested in their backstories. This is the result. 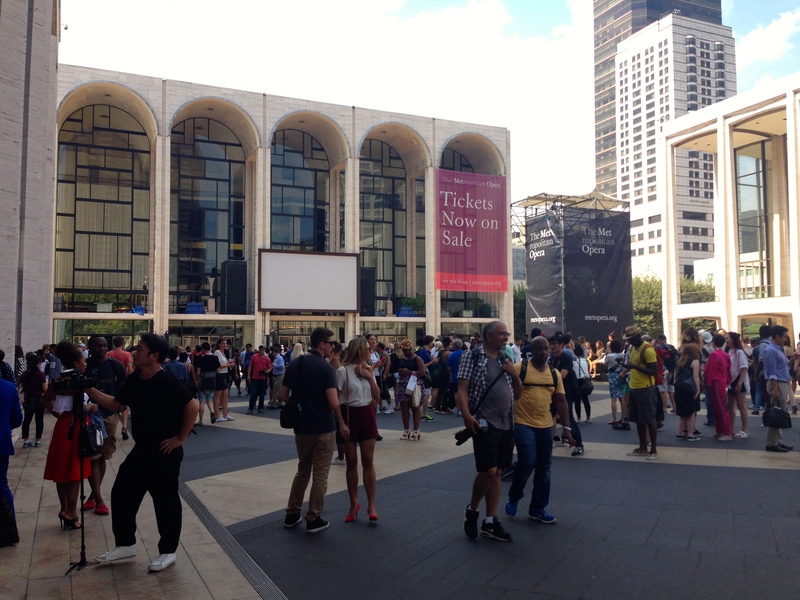 The scene outside Lincoln Center on day three of New York Fashion Week. Fashion and photography have played off of one another since Condé Nast hired German photographer Baron Adolph de Meyer to shoot portraits for “Vogue.” In the 1980’s and ‘90’s, photographer Richard Avedon shot Versace campaigns that shaped and defined the brand. Bruce Weber did the same for Calvin Klein and Ralph Lauren—neither brand would be the same today without Weber’s influence. The evolution of photography has changed the shape of the fashion industry time and time again. New York Fashion Week brings fashion’s reliance on photos into sharp focus. Go anywhere near Lincoln Center and you’ll see flocks of camera-toting photographers clamoring to capture the best runway or street style looks. Some have credentials and some are novices. Some are at work and others are there for the spectacle and the experience. All derive energy from the high-fashion culture that surrounds them as they jockey for a shot. “It’s kind of crazy,” says Morgan Beye eying the surrounding crowd outside of Lincoln Center. Beye is the director of photography for Schiffer Fashion Press in Philadelphia. This fall the company will produce a look book with photos from every runway show in Fashion Week—all 277 of them. Beye is in charge of a six-person photography team. It’s her job to corral the group and to send them out on assignment as needed. She’s an integral part of that group and comes with a few NYFW horror stories of her own. Today she’s armed and ready with a heavy camera bag on one shoulder and a clipboard clutched in the other hand. A press pass dangles against her stylish striped crop top and brushes the waistline of her black skater skirt. Her strappy heels are planted wide and firm. The next show is starting—she’s going in. Louisa Wells has just come out. She’s riding the tide of people leaving the Song Jung Wan show at the Lincoln Center Pavilion. When she makes it to the front of the crowd, she adjusts her position, bends a knee and starts snapping photos. Wells just moved here from Nashville, where she worked for local lifestyle magazines, and a few fashion bloggers reached out to her to take their Fashion Week photos. She’s also working with a friend on a “Bravo” piece, which gets her backstage access. I ask what backstage is like. She laughs, then gives a familiar answer: “It’s crazy!” Hair and makeup are constantly going on around her. The stage lights burn with the heat of a Sahara sun. But through all the commotion, Wells focuses on capturing intimate moments. But she admits that “the pit,” as they call it, can be trying. Photographers can be intimidating, especially in close quarters, Wells says. There’s a certain amount of judgment based on who shoots from a reserved spot and who boasts the loftiest credentials. Ultimately, though, photography is a democratic field. If your photo is good, it gets published. If it’s not, it doesn’t. In theory skill will out. Sixteen-year-old fashion blogger Rachel Leiner certainly believes so. She runs a personal style blog with her friend in Long Island, but her passion is photography. She’s at Fashion Week to get some practice and to improve her technique. The small lens matches her small frame, which is clad for the occasion in a simple black dress and chic Jeffry Campbell ankle boots. Unlike Wells and Beye, Leiner has no press pass around her neck. She won’t see a single runway this season, and that’s fine with her. She wants to pursue photography, but doesn’t know if it will be her profession. She might want to do fashion shoots, but isn’t keen on studio settings. She represents Beye six years ago, and Wells three. I ask who her favorite photographers are, and she answers: “I really like Richard Avedon.” She describes a famous photo of his: A black-and-white shot of a model between two elephants. Her face alive with enthusiasm, she sketches the shapes of their trunks in the air. Perhaps she, like Avedon, will be the next to shape and define a brand. Perhaps she is the next stage of fashion photography’s evolution.